The Nightbell, the cocktail bar by star chef Katie Button, starts with Woodford Reserve Double Oak and adds allspice dram and pear and fig compote. The pear and fig make for a tasty garnish. MG Road has some interesting lighting. And they serve their cocktails with a tiny High Life. Awesome. The mixing glasses at Imperial Life are repurposed liquor bottles. Sovereign Remedies has one of the most impressive bottle collections in town. Setting up for the final mix off between bartenders from the Nightbell, Imperial Life, MG Road and the Smoky Park Supper Club. Phillip Greene, who literally wrote the book on the Manhattan, was one of the co-judges of the final competition. If you're drinking a classic cocktail, you might as well use vintage glassware. Woodford Double Oak and Woodford Rye were the stars of the show. I'm a sucker for brandied cherries. The Manhattan from Imperial Life leaned on maraschino liqueur. Everyone at the final mix off got to sample each cocktail. The pear and fig garnish from Nightbell was a hit. Showmanship counts when I judge a cocktail. Luckily, nobody was harmed in the lighting of this orange peel. After all of the judging was done, a winner was crowned. The Smoky Park Supper Club earned the right to claim the best Manhattan in Asheville. A couple of ounces of rye whiskey, half that amount of sweet vermouth and a few dashes of Angostura Bitters. That’s the nuts and bolts of a Manhattan, a classic cocktail if there ever was a classic cocktail. 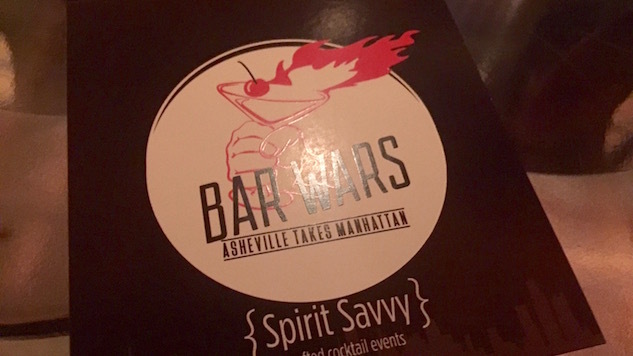 You’d think with such a rigid playbook, there wouldn’t be much room for interpretation, and yet eight bars in Asheville, North Carolina went head to head in Bar Wars, a week-long competition to see who could make the best, most creative Manhattan in town. Asheville is known as a craft beer town, but the city’s cocktail game has evolved in the last few years, as evidenced by the range of Manhattans that were on display during Bar Wars. Bartenders explored the boundaries of the Manhattan with smoked ice, mole bitters and fig dram. The cocktails ranged from traditional to experimental. Drinkers had a week to sample the signature Manhattans from each bar, casting their vote along the way until four bartenders were left standing in the Bar Wars Final. I had the opportunity to help judge the final competition, tasting four unique variations of the Manhattan back to back. The cocktails couldn’t have been more different, and I couldn’t have designed a better way to spend a couple of hours. Naturally, I spent an evening before the final mix off roaming from bar to bar, researching the techniques of each bartender. Because I’m a journalist. Check out the gallery to see scenes from Asheville’s burgeoning cocktail scene and the final Bar Wars Mix Off.